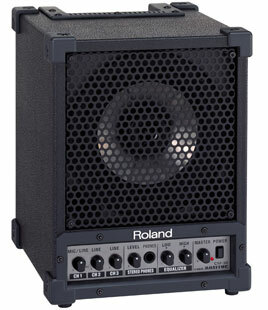 The Roland CM-30 Cube Monitor is a high quality portable PA system featuring a two-way, 6.5 inch coaxial speaker. The Roland CM-30 can be used for live onstage monitoring as well as a public address or sound system. With a built in handle and rugged construction, the Roland Cube can be moved and stored easily. This portable sound system also boasts a protective grill cover and corner protectors. With three input channels and two additional Aux inputs, the PA system is a versatile mighty mite in the sound world.